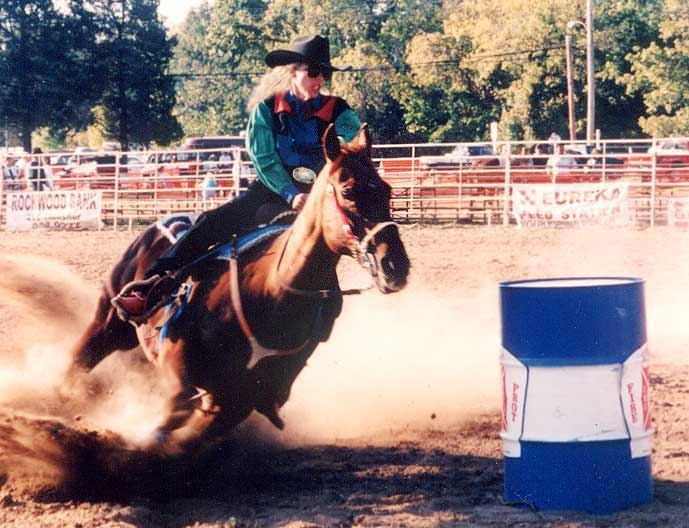 Eureka, Missouri Rodeo. 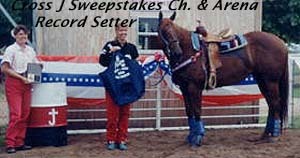 4th win, 4 years in a row! 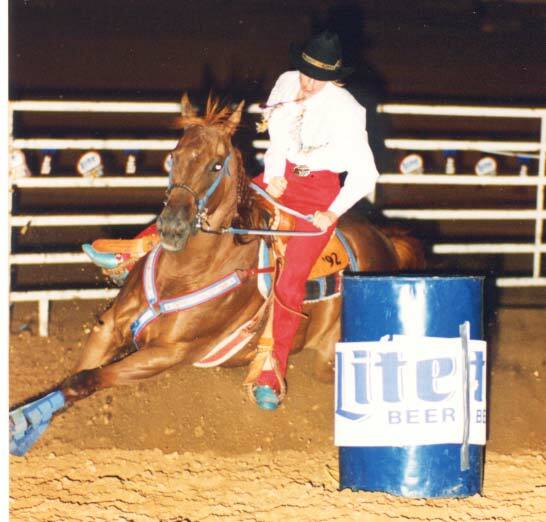 Pole bending in 1990. 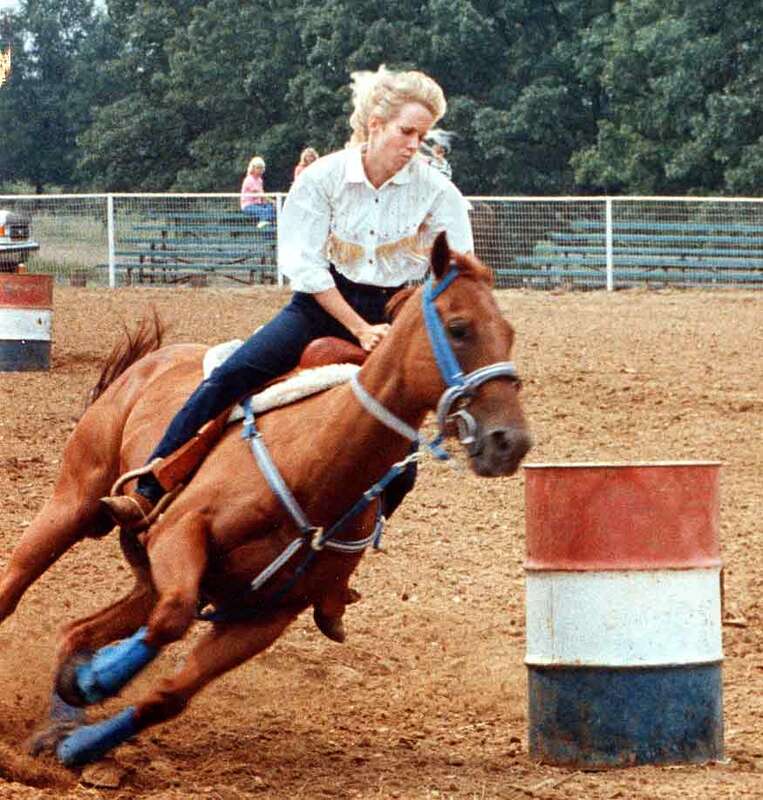 May was only 4. 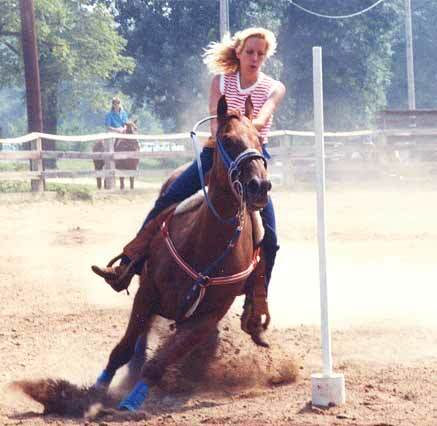 Her best pole bending time on an official pattern was 19.8 in Indiana. 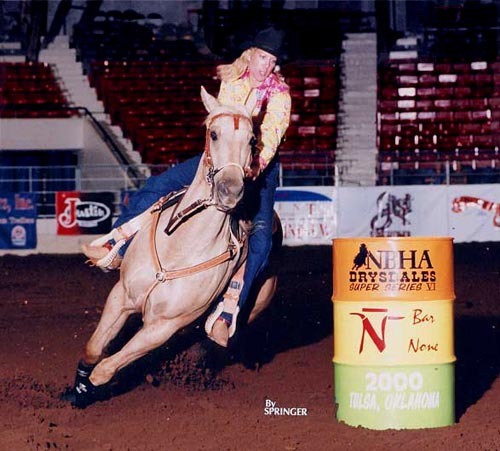 Barrel racing in Missouri, Oklahoma and Arkansas. 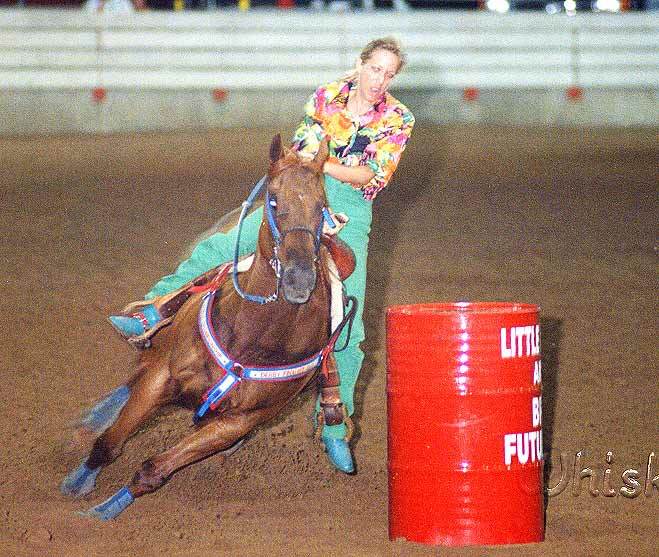 Atoka Queen at the Little Rock Futurity in 1993. 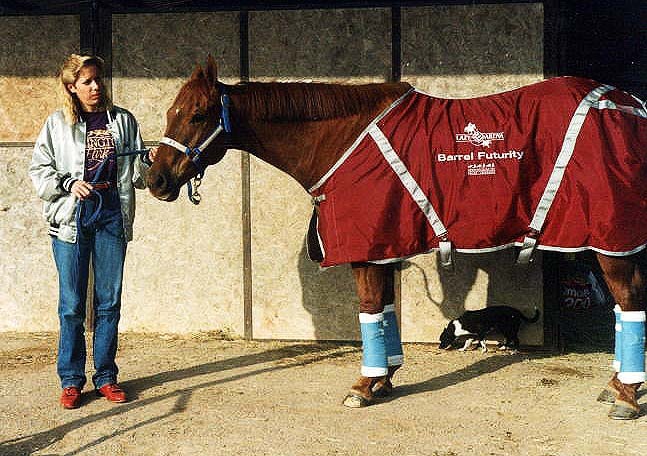 Toka had a speed index of 87, Deb finished her out, ran her successfully in many futurities and sold her to Brent Clay from Iowa. 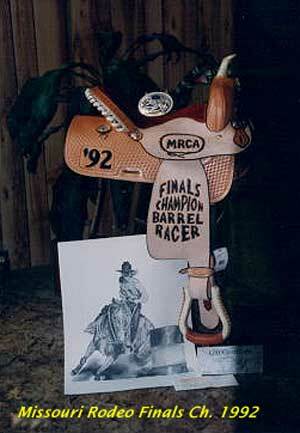 Brent rode Toka to many wins including the Iowa Mens Barrel Racing Association Saddle Championship - Twice! 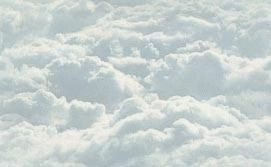 "Little Gossip" (named because nothing travels faster!) 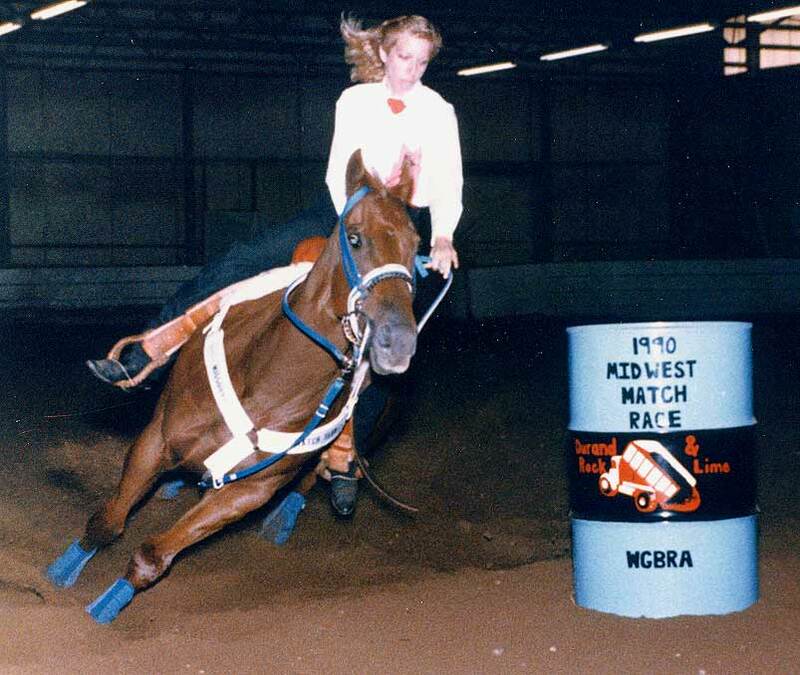 was purchased as a track broke two year old and trained by Deb. 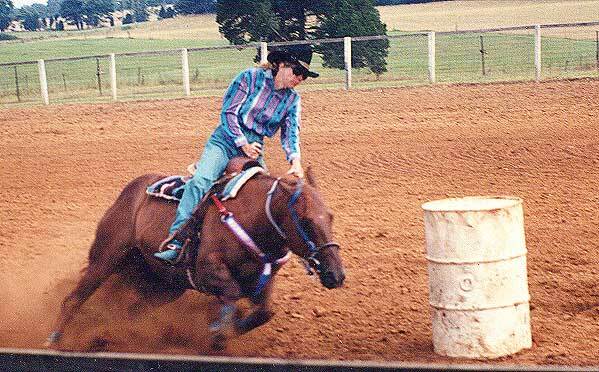 She went on to win and place in futurities and open barrel races. 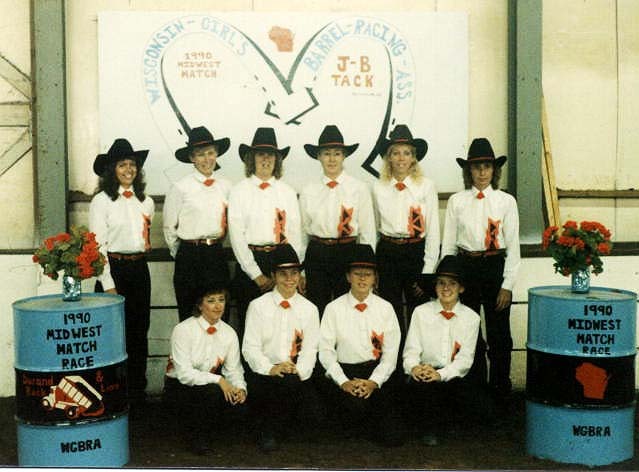 Deb ran Gossip for 4 years. 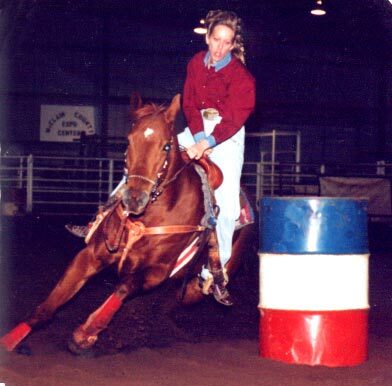 She is shown here winning a $1000 Novice class in Oklahoma as a four year old. 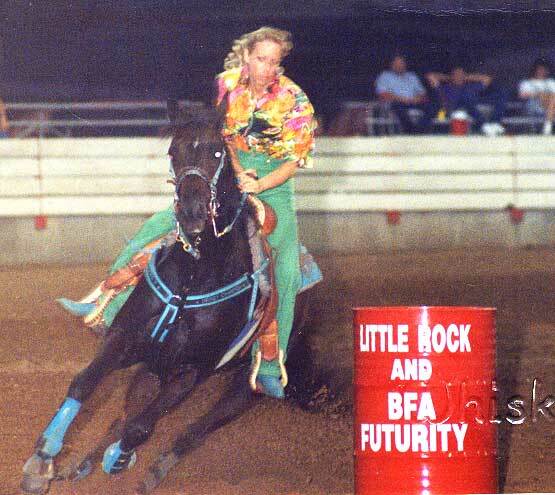 Gossip running to an 8th place average finish in her first futurity at Poteau, Oklahoma. 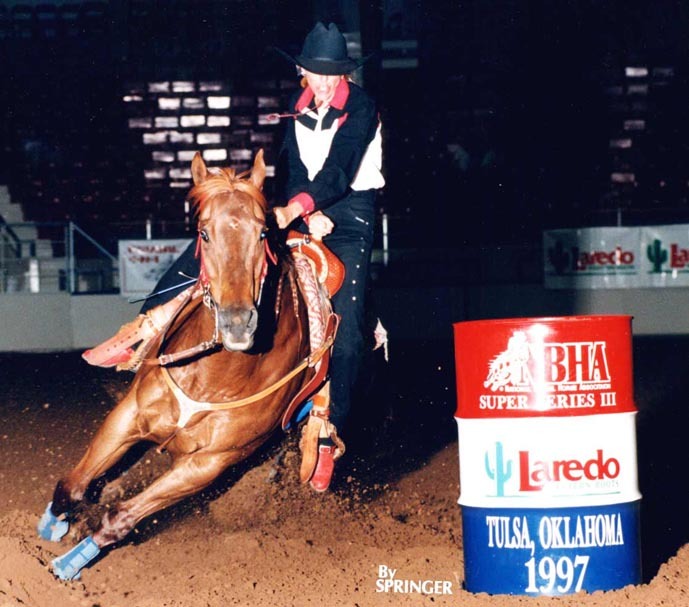 Gossip is shown here placing in the 1/2 second 2D at the Tulsa Supershow in 1996 winning $560. 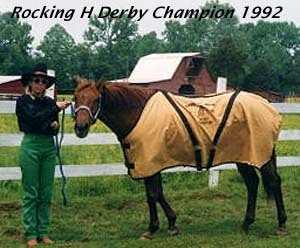 Deb sold Little Gossip to Laniece Wagner. 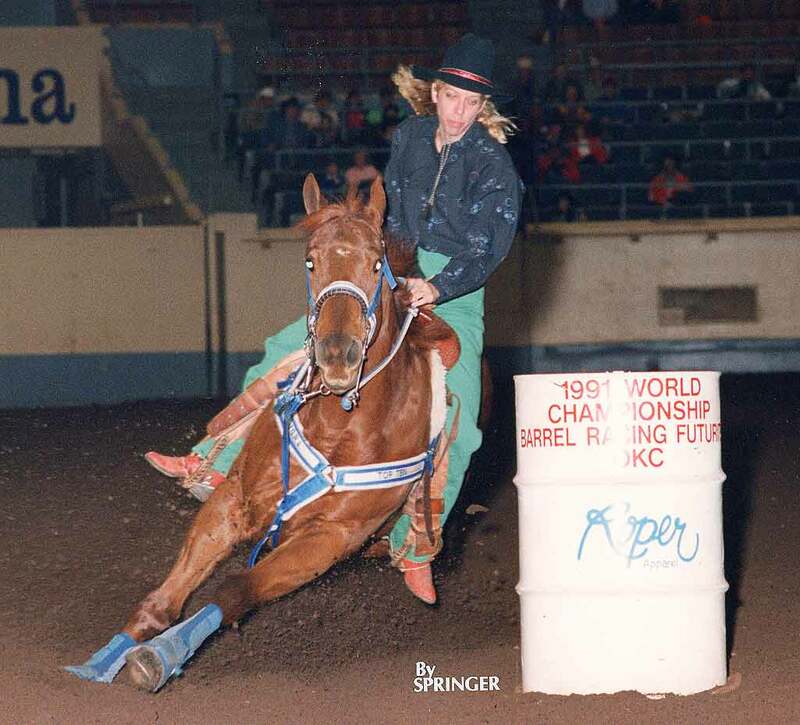 Laniece and Gossip were the winners of the April 2000 Barrel Mania Supershow '1D Shoot Out' at Memphis with a near arena record setting time of 14.6! 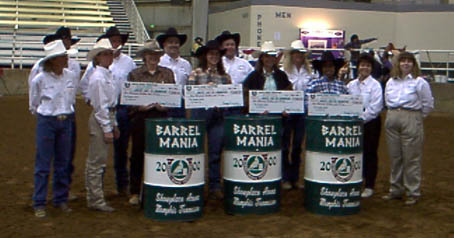 They also won the half second 2D in another run and brought home a total of $2,500 and two belt buckles! 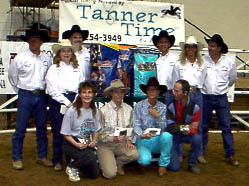 Below, Laniece receives her checks and buckles. We couldn't be more proud of them both! 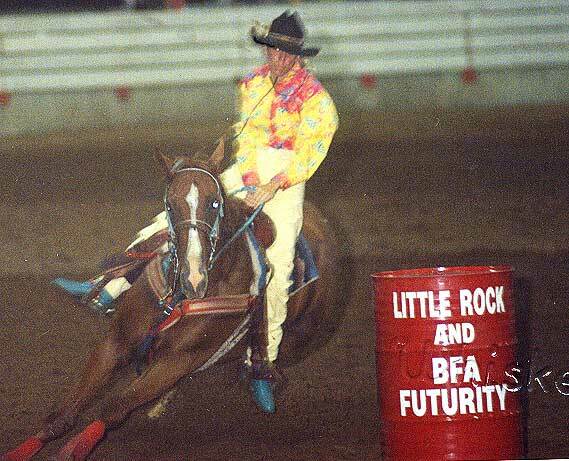 Deb trained Glass Coin as a two year old and is shown here exhibitioning her as a 3 year old at the BFA Futurity in Little Rock in 1993. 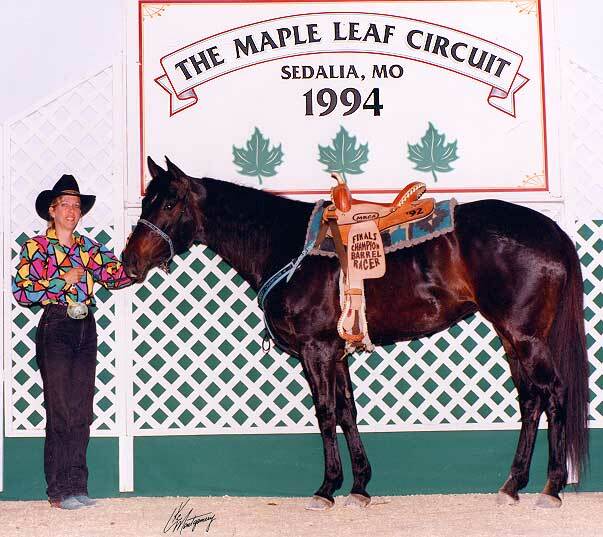 Glass went on to win the Maple Leaf Circuit Pole Bending Championship in 1994. 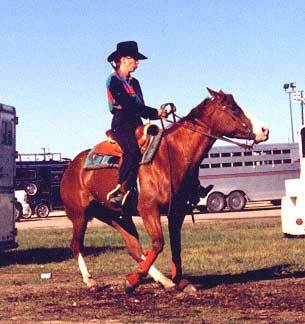 This granddaughter of Topsail Cody & Mr Joe Glo was a reining horse Deb broke and trained as a two year old. 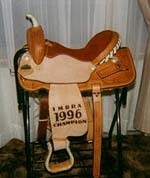 She was sold to buyers in Germany. 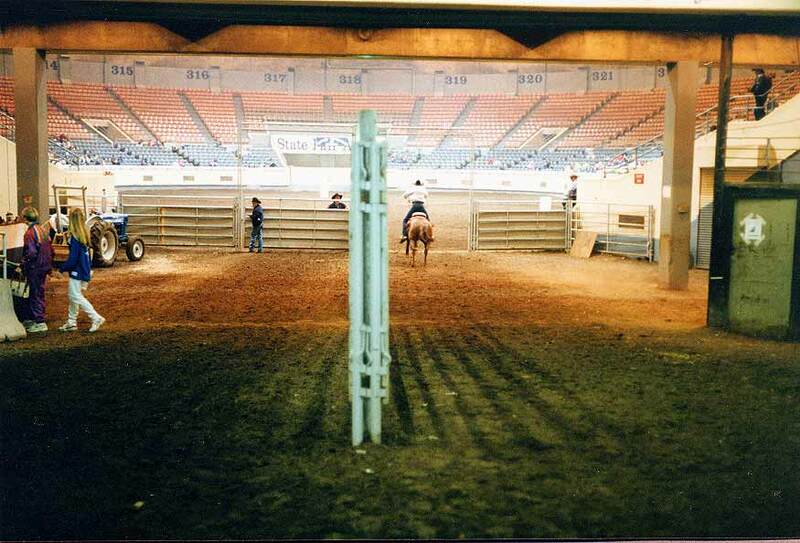 This is the takeoff site into the State Fair arena in Oklahoma City for the BFA Futurity. 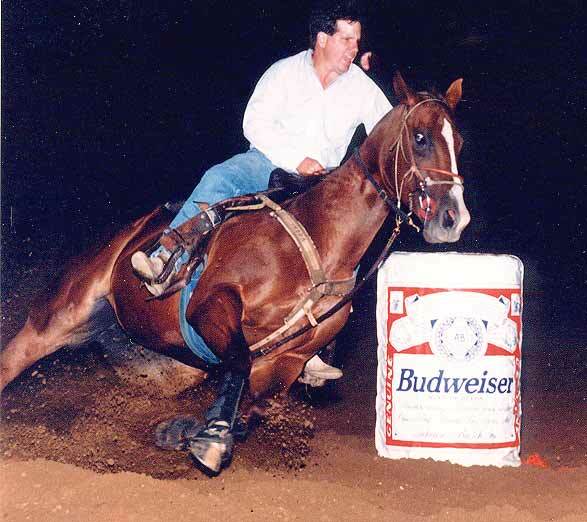 Make your heart beat faster? 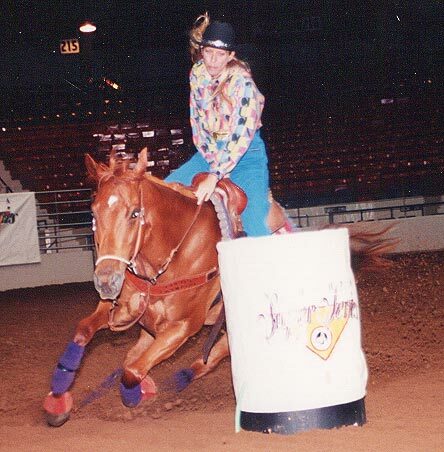 Magnolia Six Moon and Deb at the Tulsa Supershow 2000. 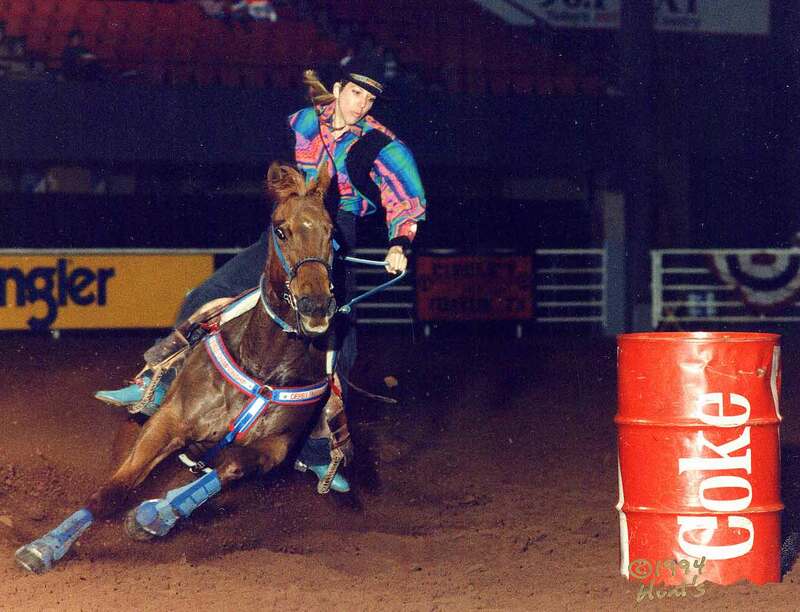 This was Maggie's first time out! 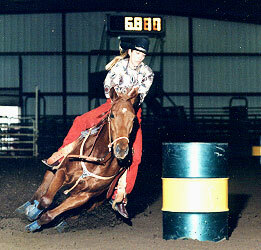 She was bred to Sticks An Stones and had a 2002 foal.